In this whitepaper, see the five steps to simplify in-house legal preservation for the finance industry and how to harness the cloud to manage sensitive data with ease. Ediscovery in the finance and banking services industry is more challenging than ever. Strict security regulations, massive data volume, and fragmented workflows add complexity to an already challenging endeavor. Financial institutions must follow tough rules set by regulators — both U.S. and overseas — or face stiff fines. 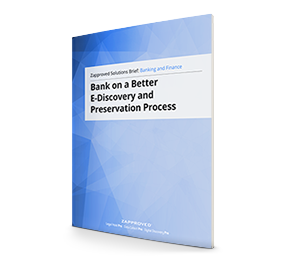 Read the Bank on a Better E-Discovery and Preservation Process whitepaper for more tips and ideas.